JAKARTA, Indonesia (CNN) -- The death toll from the crash of an Indonesian military transport plane this week climbed to 99, the military said Thursday. Soldiers search for victims at the plane's crash site in East Java Wednesday. The Hercules transport plane went down in a residential area in East Java about 6:30 a.m. Wednesday. The crash destroyed four homes and killed two people who lived in at least one of the homes, said Suwardi, the village leader of Karas in East Java. The plane had a crew of 14 people and was carrying approximately 100 passengers, Major Gen. Suwarno said. Fifteen people survived the crash, according to Bambang Sulistyo, an Indonesian air force spokesman. Wahyu Nuryanto, a staff member at the Iswahyudi hospital in nearby Madiun, told local media Wednesday that 19 people were brought to the hospital -- several with serious injuries, including multiple fractures. The 19 included air force personnel, family members of air force personnel and civilians, Nuryanto said. Shortly after Wednesday's crash, local media showed plumes of smoke billowing from a rice field and rescuers scrambling to move victims on makeshift stretchers. 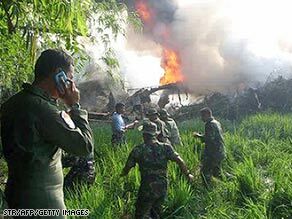 The crash came about a week after another Indonesian Hercules transport plane crashed on a runway after touching down early. No one was killed in that crash in Papua province.